Owned by Roger Johansen and Gene Holder, Tangerine Mastering was designed by famed acoustician John Storyk of the Walters-Storyk Design Group. The working environment combines close proximity to midtown Manhattan in an artist-run production arts building that houses sound stages, recording studios, post production suites, independent record companies and college radio promoters. 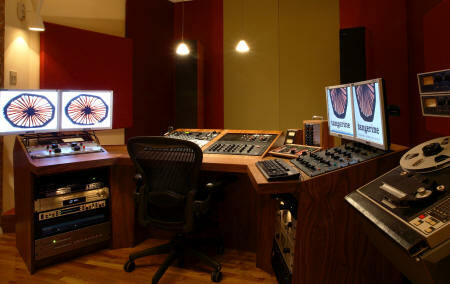 Weehawken, NJ: Tangerine Mastering is a brand-new, state-of-the-art mastering facility dedicated to providing its customers with the ultimate experience. The new facility is conveniently located just minutes from downtown Manhattan by car, bus or ferry, across the Hudson River at the Lincoln Tunnel. "We have created an acoustically precise room that offers a creative, comfortable modern atmosphere," confides co-owner Roger Johansen. "We have also brought together the best of vintage and modern equipment, and mastering engineers that offer a broad depth of musical experience." The new facility is holding an Official Opening Party at 7:00 PM on Friday, January 25 - more details and a personal invitation to follow. Owned by Johansen and Gene Holder, bass player for The db's, Tangerine Mastering was designed by famed acoustician John Storyk of the Walters-Storyk Design Group. The working environment combines close proximity to midtown Manhattan within an artist-run production arts building that houses sound stages, recording studios, post production suites, independent record companies and college radio promoters. "We strive to provide a relaxed professional musical environment that enhances the final product," Holder acknowledges. Lead mastering engineer at the new facility is Andreas K. Meyer, who has worked with such renowned artists as Hilary Hahn, Joshua Bell, Yo Yo Ma, Essa Pekka Salonen, Arcadi Volodos, The Los Angeles Philharmonic, The New York Philharmonic and The Boys Choir of Harlem. His credits as producer/engineer and composer span hundreds of CD releases. Meyer has received numerous Grammy® Awards, including Mastering Engineer in 2000 for Best Historical Album: Louis Armstrong - The Complete Hot Five & Hot Seven Recording. Tangerine Mastering's design objective, working closely with John Storyk, was to present solutions that ensure precise acoustical performance. The facility provides innovative solutions and ergonomic aesthetics that combine the latest audio technology within a comfortable, aesthetically pleasing, creative environment. Tangerine has equipped its new space with a combination of the latest digital audio workstations and processors, working with classic gear that includes an original Abbey Road EMI Mastering Chain, Pultec and Cinema equalizers plus Universal Audio LA2A compressors. Johansen started his musical journey during his teens while playing in local groups, which lead to art school and discovery of the mid-Seventies downtown NYC Music Scene. "Having played in every band that would have me I began to fuse my academic jazz education with my music interests," he recalls. "After years of being recorded I went behind the board and began recording music for my newly formed label, CAIS, which issued releases of new jazz and experimental music on cassette. In 1986 I became a partner in Lillypad Recording and began to produce bands for my new label, Albertine Records. In 1991 I opened Jolly Roger Recording in Hoboken, NJ, with my current business partner, Gene Holder." Jolly Roger was a large, 5,000-square-foot complex that accommodated up to a 40-piece orchestra, and was equipped with a vintage Neve console and separate postproduction and Digidesign Pro Tools rooms. "In 2003 we decided to focus our efforts and talents on mastering with a classic SADIE system - we knew that our combined studio experience and love for the art of making records, when concentrated on mastering, would be a winning combination." Holder is the bassist with The dB's, a power pop group of the late-Seventies and Eighties; in 2005 it recorded a moving version of "What Becomes of the Brokenhearted" to benefit the New Orleans Musicians Relief Fund. November 2006 saw the release of Christmastime, an updated version of an album released in the Eighties with contributions from Mitch Easter, Ryan Adams and many other guests. In 1991 Holder also became a partner with Johansen in Jolly Roger Recording, after mixing "We Smoke" by Broke at Johansen's Lillypad Recording. Holder became chief engineer at Jolly Roger, taking on such projects as the Bush Tetras, Blonde Redhead, Ryan Adams and Whiskeytown, Hedwig and the Angry Inch, on MTV, Luna and Yo La Tengo. "The creation of Tangerine Mastering has been a great trip," Johansen concludes. "We look forward with even greater expectations to the successful road ahead."